Scoring goals can be tricky, but not impossible. The Sensible Soccer series began life as a bit of a joke really, t’was the month before Christmas 1991, and Sensible Software had completed their game to be launched to the masses for Christmas – Mega Lo Mania. As such, the developers had a bit of time on their hands, between then and Christmas, so they played around with ideas. Being big football fans, they took the sprites from Mega Lo Mania, built a rudimentary engine for a football game, and put 11 of them on a pitch. Sensible Software realised that they had a bit of a hit on their hands, so they tidied up a lot of the graphics, tightened up the gameplay, and put every major club and European footballing nation and player into the game, and sold it to an unsuspecting audience in 1992 under the name Sensible Soccer. Sensible Soccer immediately became the best football game of it’s time. For one it captured a quick paced style of football that began to emerge in England at the time, and it achieved this by having only 3 sound effects (a whistle, a crowd noise and a thuddy kicking noise). It also had a complete lack of animation frames, I think four in total. However, with the fast pace of the game, the players hardly noticed. 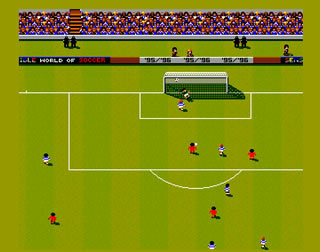 In fact, the developers managed to convince the players of the game that the footballers were backheeling, volleying, chesting the ball down and other skills in those 4 frames using the best graphic engine – the player’s imagination. So, that was Sensible Soccer, in a nutshell. Fast gameplay, tournaments, player editors, and incredibly fun game that’s still in many players top 5 football games, so what makes Sensible World of Soccer that much more special? First, the graphics have been tarted up, immensely, as has the sound. There are more frames of animation, and it feels more like a football game compared to the first game – for one they’ve included crowd and billboards, meaning that you feel like you’re playing in a stadium, rather than on a random pitch in the middle of nowhere. The players had animation, but it didn’t take over the beauty of the past games. Players celebrated when they scored, they rolled around on the floor injured when fouled, and their heads drop when they are sent off. There’s no actual change in the game animation, which is great. Furthermore, there’s more sound, with long drawn out chants and even a genuine theme song – “Goal Scoring Superstar Hero”. How they fit that pre-MP3 song onto a floppy disk I have no idea. There’s a strong managerial game in the game as well, if you are bored of playing matches. But the biggest change is also the best. It’s not a change as such, but a full management simulation, where you take any team in any of the leagues in the game through season after season with full promotion/relegation and cup competitions. What makes this work so well is that it’s a player manager simulation. You play games, or you can simply sit back and watch, and hope the transfers do the business. To be honest, it works great as a manager simulation, and great as a football simulation, though if you are to play every game, and you get good, the manager simulation loses depth. Which is why SWOS is so deserving of all it’s praise. Imagine a game today that combined the look and playability of Pro Evolution Soccer with the managerial simulation addictiveness of something like Football Manager. It’d be unheard of, and I doubt it will come this close again. Sensible World Of Soccer had the best football game at the time, and one of the top three managerial games of the time as well. This makes it a truly unique experience. Throw in a player and team editor, and some fun easter eggs (play England 66 against West Germany 66 to get the game in black & white, for example), and you have a game crafted by football fans, for football fans. I still own and play this game from time to time, the review is spot on. I still rank this as the best pick up and play football game ever.